The Compact Prime CP.2 lenses are the latest members of the ZEISS family of lenses for digital and film cameras. This second generation of the Compact Prime lenses now delivers even greater flexibility by introducing interchangeable mounts that allow the lenses to be used with a wide range of cameras from traditional cine to HDSLR systems. This new generation also offers a wide choice of lenses – from wide-angle to telephoto lenses (18 to 100 mm, including a 50 mm macro lens). 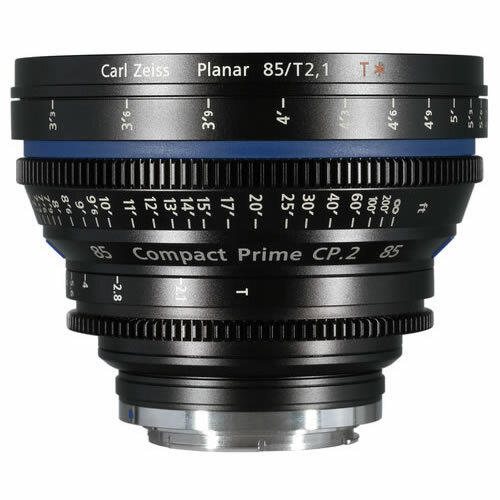 Affordable, flexible, yet of the highest quality, the new Compact Prime CP.2 lenses are a valuable edition to any film set and any level of cinematographic equipment. The Compact Prime CP.2 lenses are the world’s first cine lenses designed for use with HDSLR cameras. The interchangeable mount guarantees high flexibility for present and future use in any situation and for a wide range of camera platforms. The modern lens design as well as the cine manufacturing process and tight tolerances ensure low distortion, high resolution and excellent color rendition for sharp, punchy images. on a budget and have been designed for both film cameras and the emerging generation of digital motion picture cameras. Covering the Super 35 as well as the full-frame still format, makes these lenses a safe investment for the future. Switching between traditional film, digital PL cine cameras and HDSLR cameras is no longer an issue. The improved functionality of Compact Prime CP.2 lenses means better ergonomics compared to standard SLR lenses. The Compact Prime CP.2 lenses will be based around a common aperture of T2.1 for the standard set – an improvement compared to the first generation lenses. With precision and speed – Compact Prime CP.2 lenses are the perfect tool for Independent filmmakers, professional still photographers expanding their services or large studios using HDSLR equipment as a second camera unit for TV and film productions. Combined with new interchangeable mounts and a wide product range, the Compact Prime CP.2 lenses maximize ease of use. Changing the lenses is now fast and easy and offers great flexibility, regardless of the camera equipment used. 1. Close focus distance is measured from the film plane. 3. Horizontal angle of view for a full-frame camera aperture (aspect ratio 1:1.5, dimensions 24 mm x 36 mm / 0.944“ x 1,4173“). 4. Horizontal angle of view for a Normal 35 Academy camera aperture (aspect ratio 1:1.37, dimensions 22 mm x 16 mm / 0.8661“ x 0.6299“).